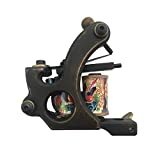 The Dragonhawk Extreme is our pick for the best tattoo machine, which is made for coloring and is made out of carbon steel. It is a rotary type and comes in 3 housing colors for you to choose from. It runs on low noise levels and has an operating voltage of 7-10 volts DC. Our step-up pick is the Dragonhawk 2 Brass and it is a set of 2 machines that work with 7-8 volts of power at 140 to 150 Hz. The brass frame is of high quality and CNC cut and there are 10 wrap coils for the shader. The budget pick is the Redscorpion Cast Iron and it is made out of quality cast iron that makes it simple and straightforward with its design. In terms of durability, it can be used for up to 8 hours straight without sacrificing quality due to its design. Getting a tattoo can be painful but worth the try for most people. They can be a work of art but they are also a product of blood, sweat and tears - hence they are to be chosen carefully as they can be very hard to remove. These things can also take time to do and no artist can do them as quickly as possible. It also take years for a person to be able to know how to make art out of human skin without making errors in their routine. It is done using a tattoo machine. 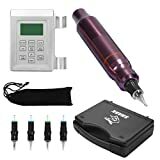 These machines can be handheld or even rotary types, but the most important thing about them is that they are the ones that are used for making these skin arts. They can be of different sizes and shapes but they all do the same thing, which is to draw on a person's skin and make different art. This imprinting mechanism is only used with caution by an expert or artist. This can take years upon years of practice as well as experience so it is highly important that you make every single moment count and make sure everything is in place if you want to get skin art. It can be a life changing event or a reminder for something so it is important that it is chosen carefully. Tattoo is considered an art by most. Each line is like poetry for some and the pain is part of the experience. The colors live and breathe into human skin and express a feeling that is a mix of various emotions and maybe because of a person or event, such as a name or a portrait. The human skin has long been a canvas for works of art, and it has been appreciated and long kept as a tradition by various cultural bodies around the world, specifically with the indigenous people. They are what make shops shine and what give artists their income and freedom of expression. To master its use, they need one to practice every single day and need to know its operation and usage with an instruction manual. Without a sturdy and reliable machine at hand, they can potentially lose customers and confidence in themselves and in their creative skin art skills. Accessories included: you should know the different accessories that come with this kind of apparatus. This can determine how ready it is for usage right away and whether the accessories can help you out on your business or for home or casual usage for hobbyists. Ease of usage: you should be able to set it up and then use it without much problems. The user instructions on the manual should be clear and concise, especially for those who are not very much used to using this kind of skin art apparatus. Frame durability: most frames can either be made of steel, aluminum or brass depending on what you buy. Brass is the most expensive, since the durability can last a lifetime, and is recommended for those who want to invest in a heavy duty and lifelong apparatus that can help them with their business. The steel and aluminum types are much cheaper and are ideal for those who are just starting out in the hobby or craft. Type: they can come in simple pen types or rotary types. The pen type is the portable one that is meant to be used while traveling while the rotary ones usually take some table space and are ideal for home or shop use. They both work well but they are preferred by different users according to their style and way of living. Safety features: it is important to have a skin art apparatus that is safe to operate and should have troubleshooting options that are easy to understand for the average artist or operator. They should be able to keep your operation just fine without breaking the skin too much or hurting your fingers while you are using it. As our top pick, the Dragonhawk Extreme is good for both shading and lining and is made out of carbon steel in its construction. The lining voltage is at 8 to 9 volts while the shading voltage is from 7 to 8 volts. With low noise levels, its needle fixing capability uses a slider system and makes it very stable. It also depends upon an industry-standard Japan motor to operate. While not a deal breaker, the Dragonhawk Extreme's only small concern is that it may not be ideal for heavy duty usage, such as for high-end shops, and you have to buy supplies separately. Our step-up pick is the Dragonhawk 2 Brass and comes with 10 wrap coils for the shader and 8 wrap coils for the liner. It runs at 7 to 8 volts and at 140 to 150 Hz for the liner and 115 to 120 Hz for the shader. It comes with a standard tube vise as well. The Redscorpion Cast Iron is our budget pick, which is a coil type and a liner that has a durable frame made of lovely cast iron. It can work for up to 8 hours due to its durability and working speed. It comes with 8 wrap coils and has a good backseat design with a solenoid valve at 28 mm in height. The Solong Custom Brass is a coil type apparatus that has 12 wrapped coils and is a quality shader to consider due to its polished brass design that is CNC cut. It has an intricate design and has a working voltage of 6 to 12 volts. For a rotary type, the SKM Dragonfly is our consideration due to its low noise levels and working voltage of 7 to 9 volts. It is easy to use and has a rotating speed of 20,000 to 25,000 rpm. 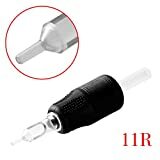 It works with most standard sized needles and skin art supplies. The BIGWASP 10 is a choice if you want a CNC carved brass frame and a shader that’s of great quality. 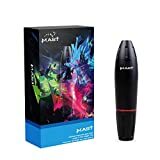 It comes with 10 wrapped coils and is ideal for professional use as well. It has a running voltage of 6 to 8 volts and is backed by a lifetime warranty. The Dragonhawk Mast Pen is a great choice for those who want an aluminum frame and a gift for the holidays. It uses a quality Japan motor and has a stroke length of 2.8 up to 3.5 mm due to its versatility. This rotary type apparatus is good for its control and accuracy and offers an easy grip. If you want a complete set with a cartridge and a console or control panel then the Shark Cartridge Kit is a good choice, with a switch frequency of 55 to 165 Hz and speeds up to 16,000 rpm. It has a needle protrusion of up to 4.5 mm and works on 6 to 18 volts of DC power. If you want a custom made design then you can try the New Star Professional, which has a sleek appearance and is a coil type apparatus. It is made with a solid cast iron frame and can be used for a business as well. The YILONG Liner Shader works well for its 10 wrapped coils and is made with a sturdy alloy frame to make it last for years to come. It can operate up to 8 hours straight without heating up due to its rapid thermal diffusion. 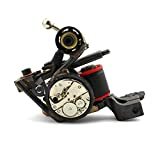 While others were promising, they did not make it to this list because they lacked the important accessories needed and had vague user instructions so even those who are regular artists could not make out how to use them properly. Q: Are there benefits to getting skin art? 1. Adrenaline rush – this refers to the release of endorphins, which can get you high, much like playing your favorite sport and getting “in the zone” due to the pain of enduring the skin art machine needle. This is because your body reacts to pain and sends endorphins to block the pain. This also helps you not just to feel good inside and out but also to strengthen your tolerance with pain. In other words, you become tougher. 2. Medicinal benefits – they can potentially have some medicinal benefits because some cultures practice them in therapeutic ways such as for acupuncture. These benefits are not very much seen by other people because they do not know that skin art can be made of different materials and they are not always a mix of chemicals. Some of the materials and ingredients are actually skin-friendly and are therefore therapeutic in their effects. Q: What are the benefits of being a skin art artist? 1. You can express yourself better through art. Being an artist is a great thing because you can put all of your joy, sorrow, anger and many other different emotions creatively into art, which in this case, is skin art. One of the best things about being able to draw skin art is that you can pour out your soul into your craft and then be proud of it. Creating skin art is something that is not just an emotional reliever but also something that will remind you of your practice, hard work and success in the future. Most people agree that being an artist of any kind and using any medium to create art is one of the most satisfying hobbies and professions of all. It may not be an easy path at first because of the lack of materials, but if you can dream it then you can really achieve it with burning passion. 2. It is more than just art – you can make a living out of it. While other people simply say that art is something that “cannot save the world” or “won’t make you rich”, think again – art is something else for most people, and that is why most paintings are super expensive and are only owned by the richest people around the world. That goes the same for skin art, because it takes a lot of expertise for an artist to reach their full potential – and it can be marketable. Today, more and more people are getting the idea of design equals money. Most people are becoming more artistic themselves and therefore getting into creative crafts such as skin art so that they can express themselves better and also potentially be known in the industry and earn cash. 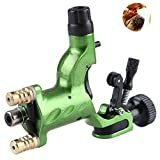 In the long run, it is not whether you earn big bucks on your tattoo shop, but whether many people are praising your work because of its quality and its uniqueness among others. 3. You can learn more by being an apprentice to other artists. One of the many things you can do to learn is to watch other people perform their skin art. You can also take some classes or go with famous artists in your neighborhood so that you can learn a tip or two in getting started. Every tattoo artist in the world starts somewhere, so you don’t have to be shy about it. Experts around the world are always looking forward to teaching the newcomers on how to execute the best kind of skin art that they can make. After all, it is an art – it is all about yourself as well as the needs of your client, so it should be something that is not just memorable and worth the pain, but also something that is perfectly done as much as possible and with a lot of art and soul. Being an apprentice may sound like a low key thing to do, but it is where most people get started because it is a way for you to learn the most basic things about skin art. 4. It is a skill that can be passed on from generation to generation. If you want to have kids someday or already have kids right now, they may potentially run your shop later on when you get older, so that the family business can run for a very long time for the following generations to come. If you want your kids to also get into skin art, you should do that when they are old enough to be responsible. Skin art is something that can be learned by anyone – and once you have mastered it, you can teach it to someone else and pass it on from one generation to another, or from one culture to another. It is a skill that cannot be taken away from you. 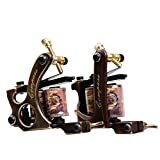 Even if your supplies are gone or whichever tattoo machine you use – it is important to have skill. The future generations may benefit from ancient skin art as well, such as those that have been passed from ancestral traditions, so that they are kept alive in today’s modern tattooing technologies. 5. You will earn utmost respect from people if you practice this craft. It is not just a person who has skin art that gets the best respect – it is also those people who make this kind of skin art that gets a lot of respect. Like all of those who painted the most beautiful paintings and the most expensive artworks around the world, people pay homage to those influential in any art form, including skin art at best. Skin art is considered an art form so people who are an expert in this field truly deserve to be well-respected. There is nothing like showing others that you have got some skills to brag about and that you are not completely useless as a person – you have talent and you have a way of living. You are unique and you can show it to the world. In the long run, if you do really like art and you like skin art in particular, there’s no reason not to learn how to do it – if it is your lifelong dream. Q: Why is tattoo an art? 1. It is a visual language that can tell a story. Art is all about telling a story through some form of drawing or painting, and skin art is no different. Using the human skin as the canvas, it could be telling a story about a girl and a boy who were star crossed lovers, or it could be telling a story about fighting against cancer, fighting for freedom or even about your children. The thing about any art form such as skin art is that you can tell the world what you really want to say, which is why most of the skin art today have deep meanings, even from before. Skin art is meant to tell you stuff like “she said yes!” or “love wins over hate”, even if it is in Chinese characters or some other symbolism that you might prefer. The cool thing about these skin art designs is that you can mix and match them depending on the user’s preferences and depending on what you want – and you get to hear the stories from all walks of life. 2. It can be a means of expressing one’s emotions. One of the reasons why people get skin art is because they have a deep emotional concern that they don’t want to let go, such as being thankful for a certain event in their life. For example, most people get religious skin art because they’ve experienced the miracles of God or whatever religion they’re in, as a reminder in their life to stay strong through the trials of life. In some other reasons, they can just simply motivate a person using signs and symbols. It’s not just about the Chinese characters that you often see – or the runic alphabets that other people prefer. It can be of any font, size and it can even be in any language, as long as it has meaning. Added to that, pictures symbolize human emotions as well and may not just be for display like other people thought they’d be. True enough, since skin art is considered an art, it is also a way to help people express themselves with what they feel, their lifelong emotional state and what they feel about their lives. 3. It brings about a sense of individuality in each artist. All skin art artists have their own styles, and this helps them to bring about a sense of individuality. As with painting and other visual arts, it’s hard to find two artists who have exactly the same kind of style – there is still some other variation, especially because everyone’s experience and preference is different. For example, one artist just prefers monochromatic skin art designs while others prefer colored ones. Some prefer the traditional way of applying skin art while others prefer the more advanced technologies that are available today. The preference can vary from person to person, and that is why each artist can be different in their own individual way, which makes it an art form. Just like how Picasso’s oddball style is different from Van Gogh’s swirls, which are both different from Da Vinci’s realistically high contrast paintings, each skin art artist has his or her own way of doing things. 4. There can be many styles to skin art depending on various cultures and trends. Different cultures may harbor some styles that are unique to them. For instance, India is known to have the henna tattoo and their designs are mostly intricate with patterns of mandalas (a.k.a. those kaleidoscope like things that are commonly found in adult coloring books), which makes their country and culture unique. Other countries may also have their own identity with designs. Tribal patterns may have existed from those traditions that came from indigenous people of various cultures, such as those who live in the mountains. Today, there are many cultures that are still practicing old forms of skin art and they are most often preserved by national commissions of countries as a heritage and as an art form. These patterns and designs can vary from culture to culture and from generation to generation. Therefore, skin art, like all other arts, brings about the cultural differences and identity of a country or even a city, state or town, which you should be proud of as well. 5. It enhances the creativity of people. As it is an art form, it boosts creativity because you get to play with the lines, curves, shades, colors and many other aspects of the skin art design, as you would on a regular canvas, paper or even your drawing tablet. Creativity is something that is not just in art, but also applied in other jobs that require some variation, such as serving ice cream, or thinking of new ice cream flavors. Creativity is a skill that is best enhanced with art forms like skin art. To a skin art artist, there are many options and there are many concerns that he or she should go through when choosing the right design and doing the right operation for a person or client. They have to know the person’s skin type, the placement, the type of needle, color combination and other things to make the application successful, just as with paper art. Overall, creativity is an important skill not just in the field of arts and in skin art, but also in life so we can learn how to think outside of the box in real life situations and not just in performing various kinds of art. Q: What are the bad effects of skin art? The way that your skin can sweat can potentially change if you do get skin art, and it can be reduced up to 50 percent, which can be dangerous because you won’t cool down properly if you’ve been working out and you have a ton of tattoos around your arms. Some studies may also link the use of skin art to melanoma, which is a cancerous disease or a skin cancer that is caused by melanocytes. There are also other studies that link to skin cancers. In fact, many artists who have gotten skin art have experienced skin cancer and some even passed away because of it, so be very careful. If your ink has been tainted with some sort of weird chemical and it accidentally gets into your blood, it can potentially form blood-borne diseases, which can be dangerous, and happens with unregulated ink. Q: What countries in the world have the most tattooed people? 1. Sweden – if you want a really good place in Europe to get skin art and see a lot of people get skin art then Sweden is a great place to start with. Along with other Scandinavian countries in Europe, Sweden is one of the best out there with one of the most populous in terms of skin art people. Most of their designs come from their Viking roots, as well as Nordic culture and mythology. 2. United Kingdom – surprising for most people, as the UK is known to be all “high and royal” to most other countries’ perceptions, the UK is actually one of the countries with a lot of people with skin art. In fact, even King Edward VII and other royals had skin art and the British army even promoted such a form of art. Their theme is usually a variation of symbols so there’s not particular style. 3. Australia – while most people would think that Australia’s in the list because of their “criminal background”, since skin art is usually associated with gangsters and crimes, it’s actually a form of aesthetic art in some, and Australia’s one of those countries that you’ll most likely find someone with near full coverage skin art. New Zealand also has some really cool designs when it comes down to skin art, especially traditional ones, which are nature-themed. 4. China – while the rest of the world thinks that tattoos are for the “bad guys”, the Chinese think otherwise – they’re “intended for the royals”. Common Chinese themes when it comes down to skin art design include dragons, snakes and the like, which, in fact, the West is trying to adapt in many ways. Many people from the West and other countries are fond of Chinese skin art and go as far as getting meaningful Chinese characters on their skin. Q: Which parts of the world are considered best tattoo destinations? a. London – just as they are one of the most tattoo-friendly countries in the world, they are also one of the best places to get skin art that’s of quality value. Alex Binnie and Maxime Buchi are some of the best pioneers of the craft and hobby in this area of the United Kingdom. b. Polynesia – just as we also mentioned that New Zealand is on the list of skin art friendly countries, they’re also on the list of the best places to go to for a nice skin art, especially if you are looking for quality tribal designs. Consider going to Sulu’ape Petelo, Julie Paama-Pengelley or Steve Ma-Ching for adding a Maori touch to your skin. c. Israel – oddly enough, while skin art wasn’t completely associated with religion, nowadays, times are changing and skin art is slowly becoming popular in the so-called “holy land” by the Catholics. Yasmine Bergner and the studio Psycho Tattoo are some of the best among the best in this country, as well as those on the side of the roads of Jerusalem while you’re on a Christian pilgrimage, such as Wassim Razzouk and Gabrielle Predella (husband and wife). d. Japan – now most of you are thinking and screaming “Yakuza” when it comes down to skin art in Japan, which is partly true, because the Yakuza gangsters have certainly adapted skin art that’s traditionally done and called “horimono”, which uses bamboo and ink for application. Horiyoshi III, Taku Oshima and Horimitsu are some of the most well-respected Japanese artists in terms of colorful skin art. e. United States (San Francisco Bay Area) – usually associated with the bay area festival, skin art in this part of America is one of the best around the world. The works of Ben Grillo, Lyle Tuttle, Ed Hardy and many more are the ones that pioneered the scene. You can also consider the works of Takahiro Kitamura if you want Japanese-themed and Asian designs. Q: Which countries aren’t friendly with skin art? 1) South Korea – while not illegal, they are only allowed in hospitals (which is kind of weird and awkward for most people). 2) North Korea – also not illegal, but there are specific laws about them, since we all know how North Korea can be unpredictable with laws. 3) Japan – while they harbor one of the best skin art cultures and designs, they’re actually pretty strict with laws because of the connection with Yakuza gangsters. 4) United Arab Emirates – as an Islamic country, of course it doesn’t allow skin art due to being “self-injury” according to their virtues. 5) Sri Lanka – if you’re insulting other religions with your skin art then you’re probably going to get arrested or apprehended here. 6) Iran – much like with the UAE, it’s in their Islamic nature so skin art is something frowned upon here. 7) Turkey – there was a ban on skin art among those in schools and universities due to its educational system change. 8) Denmark – they have a law that forbids skin art completely, but a political party in the country may be soon able to change the laws. Q: Are henna tattoos safe? A: These forms of skin art that are commonly found on the beach are very popular among tourists. They are considered safe because they are not permanent unlike regular tattoos. They can be easily washed away depending on the type of your skin and how often it is exposed to the elements and water. However, if you chance upon black henna, then that’s like getting a real tattoo but with potential side effects because it is chemical-based with paraphenylenediamine that can potentially cause skin irritations, which is bad for your skin overall. Q: Which jobs allow skin art to be exposed? 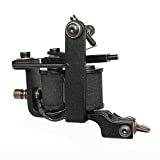 Q: What are the types of tattoo machines? Coil types are the most basic of all because they make that common buzzing sound in the skin art shop. They are very simple to operate and are the best in adjustability. They use an armature bar in their mechanism to work. Rotary types are the newer ones and tend to be quieter than the coil type. They can be less messier than the coil type as well and they mostly use electricity to work. Pneumatic types are the ones that use air for them to work and to get the motor running. They use an air compressor to fuel them, much like pneumatic hardware tools. Q: What’s the difference between coil and rotary ones? Q: How are liner and shader machines different? Q: What should I consider when deciding for a tattoo? 1. Does it mean anything to you? 3. Where will it be on your body? 5. How will you handle the pain? 6. How big will it be? 7. How skilled is your skin artist? 8. How will other people around you react to them? Q: How do I avoid spotty marks when doing skin art? a. Go for a soft running skin art apparatus when you are lining. b. Circular motions that run smoothly can also help improve the texture. c. The choice of magnum needles are also crucial for adding better gradients. d. If circular motions aren’t your thing, you can go for scrubbing motions. 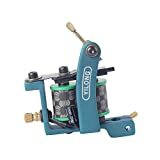 Q: What are the types of rotary tattoo machines? The needles is on the cam wheel while the motor shaft holds the bearing or cam wheel. It’s great for low noise levels. Needle stabilization can be difficult. A bit similar to the coil type in which you have an armature bar. Great for stability and adjustability. Not very good with noise levels. Uses a sliding mechanism for the needle bar. Smooth movement and low noise levels. Machine can heat up easily due to sliding friction. This type uses a swash plate that goes up and down with the motor. Low on noise levels and can be smooth in operation. Stability problems if you run it at a high voltage or don’t lubricate it enough. Q: What are the common skin art ink materials to choose from? Q: What are the types of skin art needles? Q: Is it dangerous to get tattooed when pregnant? Q: What’s the youngest age to get skin art? A: In most cases, the youngest age to get skin art is 16 years of age, as long as they have the consent of their parents or legal guardian. This can vary depending on your legislation and the laws governing your country, state or area. 16 years old is most likely the case for America, but in some countries, it can be the legal age of 18 or even 21. Q: Can seniors also get skin art? What should be considered? 1. Make sure the artist is skilled at handling senior skin. 2. Consider a design that’s okay for fragile skin. 3. Make sure you practice good skin hygiene afterwards to avoid infections. Basically, much like adults could get their skin art, it’s not an impossible thing for the old folks to put some artistic display in their skin to please themselves or to act as a reminder for something, since old age can potentially make us forget about things, eventually. 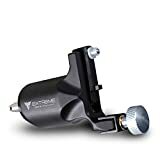 Overall, we think that the Dragonhawk Extreme is our pick for the best tattoo machine due to the good working voltage, low noise levels, carbon steel construction and other good features.